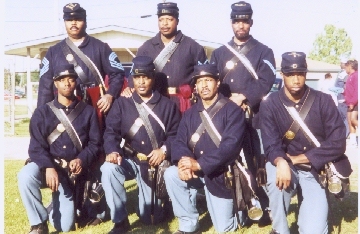 The First Mississippi Volunteer Infantry (African Descent) was organized in May, 1863 at Millikem's Bend, Louisiana and Vicksburg, Mississippi under the command of Colonel A. Watson Webber, and redesignated the 51st United States Colored Infantry Regiment on March 11, 1864 as per Orders Number 7, signed by Adjutant General L. Thomas, by order of the Secretary of War. As recruits, participated in the Battle of Milliken's Bend June 5 thru 7, 1863, and subsequently attached to Post of Goodrich Landing, District of Vicksburg, Mississippi until December, 1864. Assigned to the 1st Brigade, 1st Division, United States Colored Troops, District of Vicksburg, Miss., until February, 1865. Reassigned to the 2nd Brigade, 1st Division, Steele's Command, Military District of West Mississippi until June, 1865. Last assignment was to the Department of the Gulf until mustered out in June, 1866. Battle of Milliken's Bend, Louisiana June 5, 6, and 7, 1863. At Lake Providence, Louisiana till May, 1864. Post and garrison duty st Goodrich Landing, Louisiana, till December, 1864. Action at Langley's Plantation, Issaqueens County, March 22, 1864. Floyd, Louisiana., July 2, 1864. Duty at Vicksbnrg, Mississippi, until February, 1865. Moved to Algiers, Louisiana, February 28, 1864; thence to Barrancas, Floridia. March from Pensacola, Floridia, to Blakely, Alabama, March 20-April 1, 1865. Siege of Fort Blakely, Alabama April 1-9, 1865. Assault and capture of Fort Blakely, Alabama April 9, 1865. Occupation of Mobile, Alabama April 12. March to Montgomery, Alabama April 13-25, 1865. Duty in Montgomery and at Mobile until June, 1865. Ordered to New Orleans, thence to Texas. Duty on the Rio Orande and at various points in Texas until June, 1866. Mustered out June 16, 1866.